"Friede" was the first real spaceship in the movies. It was designed by one of the founders of modern astronautics and was an Art Deco masterpiece so scientifically accurate it gave the Nazis nightmares. Frau im Mond (Girl in the Moon) was the seminal space travel film of the prewar period. It premiered on October 17, 1929. Directed by the legendary Fritz Lang, this over three hour epic detailed the construction and flight of a rocket (the Friede) to the Moon. Our heroes are trying to gain access to a legendary cache of "lunar gold." The rocket was designed by Hermann Oberth, who also acted as the film's technical advisor. He based the movie rocket on the Model E spaceship from his book, Wege zur Raumschiffarhrt (Ways to Space Flight). Oberth published Wege zur Raumschiffahrt in 1929. This book, an expanded and revised edition of his unexpectedly popular Die Rakete zu den Planetenraum, is quite possibly the most influential single work on spaceflight ever published. Oberth covered in amazing detail virtually every aspect of the problem, from engineering and ballistics, to space medicine. The "Model E" was a blunt, bullet-shaped rocket 35 m tall and 10 m in diameter. The two-stage rocket was fitted with the four large fins equipped with steering vanes that characterized most of Oberth's designs at that time. The nose of the second stage contained a small passenger compartment. The crew, who laid in couches for take-off, could observe the outside through. The compartment was also equipped with leather loops for use in free fall. The crew could exit the rocket through an airlock tunnel. The return to earth was to be by parachute. Other than the serendipitous discovery of a breathable atmosphere on the Moon, Frau im Mond was the most authentic depiction of spaceflight to reach the screen until Destination Moon in 1950. Among the great many prescient moments in the film-such as the roll-out of the spaceship from its vertical assembly building, in a scene that might have been taken at Kennedy Space Center-is the first launch countdown in film history. When Frau im Mond was first shown in Britain it was described as scaring the members of the Foreign Office "witless." 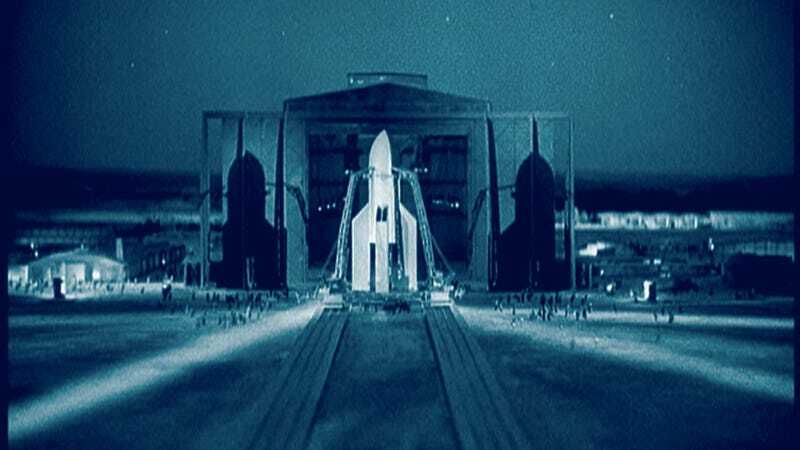 All prints of the film are withdrawn from distribution by the Gestapo, who also seized the 5-foot metal model of the spaceship, which was either destroyed or lost during the war. The model spaceship was built so it could be opened, revealing all the details of its interior. This appears only very briefly in the film. It's a gorgeous thing and a tragedy that it was destroyed. Happily, some excellent photos were taken of it from various angles—-including its incredibly detailed interior. Some of these rare photos are shown here for the first time. Recently, master model maker Lee Staton was commissioned by the Foundation Museum of the History of the Federal Republic of Germany to recreate the model of the Friede. It was to be part of a display in a special exhibition devoted to the science fiction films of Fritz Lang. It was to prove to be one of the most challenging tasks he had ever undertook. Oberth had published detailed plans of the Model E in his book, but the movie version differed substantially. A careful viewing of the film, however, revealed a few frames in which plans appeared. Enhanced in Photoshop, these revealed the new details, but some things were still changed during the construction of the sets. Staton had to go through the film, frame by frame, in order to make his model jibe with what was seen in the movie. The final model would eventually meld the miniature seen in the film with the sets used during filming. "The movie miniature," Staton says, "did not reflect the full-size cabin set used by the actors, while my model will." Hundreds of hand-made parts were replicated by vacuum-forming and laser-cutting, some of which are scarcely visible in the finished model. Since the final model is only 30 inches tall, the exquisitely detailed interior had to be assembled with tweezers and a magnifying glass. Since the movie was shot in B&W, Staton had to guess at colors, eventually deciding on an Art Deco palette he felt was most realistic. "One reason I find the set compelling," says Staton, "is that it was a well-designed interior for a spacecraft, with seats and tables that folded into the walls and handholds and footholds for zero G. It was a 2-story set with ‘wild' walls that could be moved for filming. It was also gimballed, which can clearly be discerned during a turbulent sequence of shots in the movie." This was a technique used by George Pal in making "Destination Moon" and most memorably by Kubrick in "2002." "Not bad for 1929," says Staton.